I am just about finished with Vilnius Poker, our reading selection for November which was due last Friday. 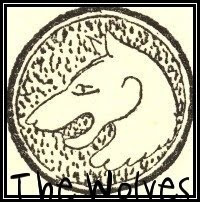 So while we're awaiting my belated post, I thought now would be a good time to announce the 2011 reading schedule for The Wolves, previously known as the Unstructured Book Group. We're a small group of bloggers who met during a read-along of Roberto Bolaño's 2666 back in 2009 and have been hanging out online ever since. As you can probably tell from the list, we're an eclectic bunch with a special fondness for translated/international literature. Do feel free to join us at any time! "Meetings" are held on the last Friday of each month. Click here for the 2010 schedule. I always want to intrude on this little party, but I never seem to have the book read on time. I might try this year for a little guided reading. A great diverse lineup. I may be able to attend the meetings on June and July as I own the books. I'll also try to look for copies of titles that interest me. That would be great if you two could join. I actually thought you already were a member, Lu? I know Rise did the Borges side trip a few months back and had some good posts. This is a great list, I agree. Highly tempting. I very much want to join you, but I will have to see whether I can crowbar some time into my reading and work schedule!